Explanation: Why don't these pieces fit? This third quarter Moon (left) and first quarter Moon were both photographed during the last lunar cycle or lunation with the same telescope and camera. But, simply combining the pictures into one sharp, full surface view would clearly be a problem. In fact, on October 6th the Moon's third quarter phase happened to occur near lunar apogee, the farthest point in the Moon's orbit. On September 21st, the first quarter phase fell close to lunar perigee, the Moon's closest approach to planet Earth. 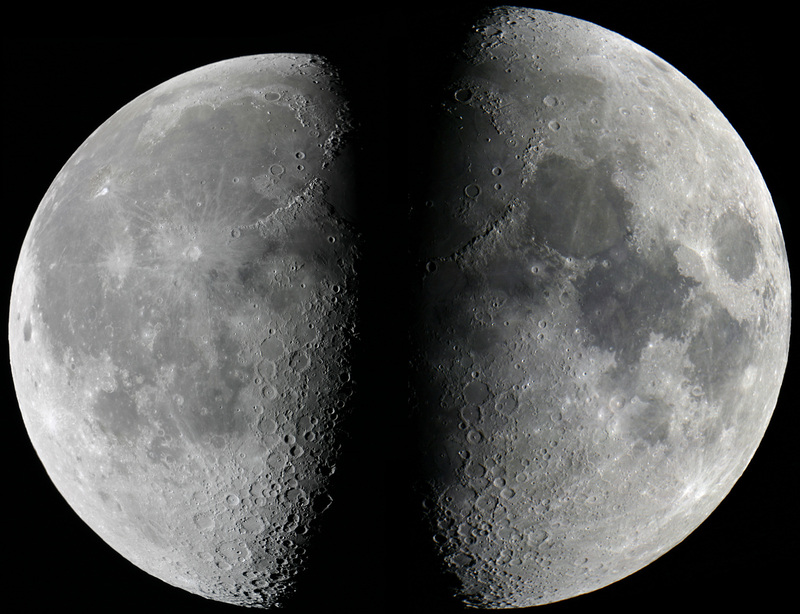 Viewed two weeks apart, the resulting difference in apparent sizes would not be noticed by casual skygazers, but the simultaneous side by side comparison makes it hard to ignore. Skygazers will likely notice the Moon next week though, as it slides through Earth's shadow during October 27th's total lunar eclipse.